Obama-Romney Presidential Debates—Anyone Still Undecided? 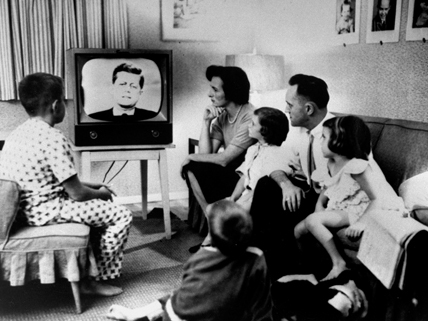 An American family gathers around a TV to see the 1960 Kennedy-Nixon presidential debate. With November 6, Election Day, fast approaching, the 2012 presidential debate “season” has come to an end. Any voters who began the month of October with their minds not made up have had three opportunities to see the candidates go head to head. The debates between the incumbent president, Democrat Barack Obama, and the challenger, Republican Mitt Romney, have offered voters the chance to see for themselves how well the candidates speak to their concerns, or respond under pressure. Each debate was viewed by a broad national TV audience of tens of millions. Obama and Romney first squared off on October 3. According to most observers, the former Massachusetts governor won decisively, and Romney’s performance was reflected in a surge in the polls. As a result, the overall race, especially as it plays out in the “swing states,” has become much tighter. The second presidential debate, on the 16th, featured a “town hall” format. Selected citizens asked questions directly to the candidates, on topics ranging across both domestic and foreign policy. The third debate, held on October 22, focused on foreign policy and national security issues, though both candidates tried to steer the subject back to issues such as the economy, education, taxes, and deficits. President Obama made up ground lost in the first debate with more aggressive and confident performances in the second and third debates. Most observers gave him the win in both cases, but Romney continued to present a solid challenge. Both candidates frequently contested each other’s statements as untrue, and fact-checkers have worked overtime trying to analyze the claims and counterclaims. The single debate between Vice President Joe Biden and Congressman Paul Ryan was held on October 11 and covered both domestic and foreign policy issues. The vice presidential debate was generally characterized as a draw, or tie. This is the official website of the bipartisan national commission that oversees the U.S. presidential debates. Visit this clearinghouse for election 2012 news; includes full schedules and details of the upcoming presidential debates. Check out the complete history of presidential debates since in the age of television. Explore footage of historic presidential debates, recaps of every presidential election since George Washington ran unopposed in 1792, bios of U.S. presidents, an explanation of the Electoral College, and more. I JUST THIS TO END!!!!!!!!!!! Agreed gyfduxdt6td, any1 who says other wise should know that he’s the frekin person that put us in this stupid mess so why the freak would we even vote for him! I’m not sure who I want to win this election.Obama sounds good but he has had many problems in the past few years. Romney says he’s going to improve things which is good, but he doesn’t really have any proof. heck ya this is going to be one sweet current event! Barack Obama Tucson Memorial Speech: Together we Thrive White house staffer found copy of Faces Of Hope, a book picutring 50 babies born on September 11, 2001. One was Christina-Taylor Green, the girl killed in the shooting . That book contained a quote from Christina that Obama incorporated in his speech: I hope you jump in rain puddles . Obama devoted four or five sections each to summarize the lives of the six that was killed in this section of his speech: Our hearts are broken and yet, our hearts also have reason for fullness.